Exceptional softness and a unique molecular structure make Alpha GEL a highly effective shock absorber. 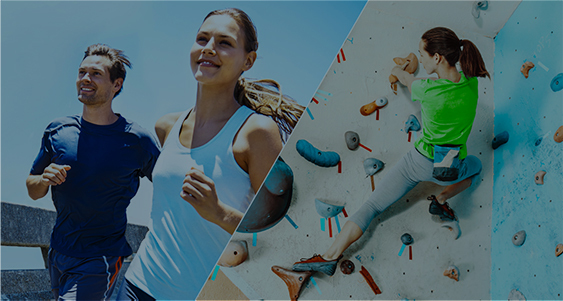 Alpha GEL’s durability, safety, and thermal resistance (-40°C - 200°C) combined with Taica’s know-how and technical expertise allow us to offer the perfect shock absorption solution tailored to your needs. Alpha GEL is exceptionally soft, able to cushion the fall of an egg dropped from a height of eighteen meters without breaking it. This softness is impossible to realize with conventional rubber. Alpha GEL is exceptionally durable and resistant to weather, ozone, UV radiation, and chemicals. It shows very low compression, resulting in long-lasting, stable performance. Alpha GEL has long been used in external applications, sometimes for more than 10 years at a time. It does not deteriorate like other rubbers and foams, retaining its softness long-term. Alpha GEL performs reliably at temperatures between -40°C and 200°C. We will do our best to fulfill your needs with customized GEL solutions. Alpha GEL products can be made into any shape and hardness. They can also be combined with other materials to improve functionality, e.g. improved shock absorption. A raw egg dropped from a height of 18m - equivalent to the sixth floor of a building – remains unbroken when caught by a sheet of Alpha GEL only 2cm thick. Alpha GEL absorbs shock by turning impact energy into deformation energy. A large force called impulse force becomes generated the moment an object falls to the ground. The scale of the impulse force not only is proportional to the energy of the impulse (which is related to the object’s colliding speed and weight) but also depends on material characteristics of the shock-receiving surface. Hitting a surface made of stiff materials like concrete or asphalt would shorten the stress generation time period (i.e. 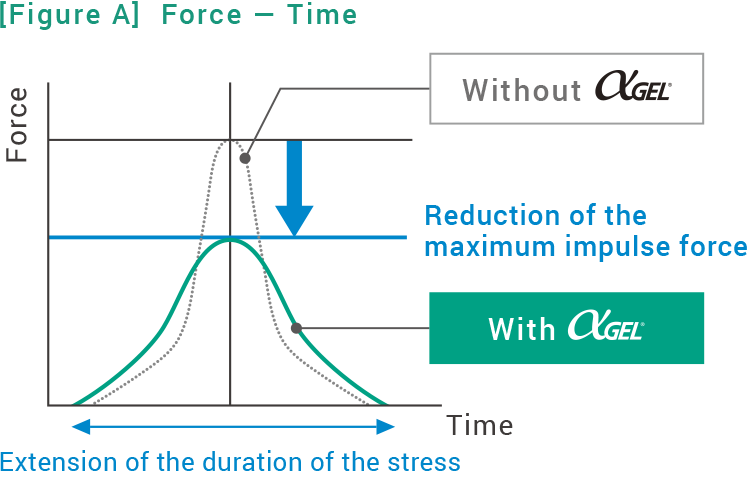 the duration of the stress), creating a significantly large maximum impulse force. But this force can be reduced by using materials called shock absorption materials that extend the duration of the stress (see Figure A). The figure below shows deformation and stress generation in shock absorption materials(see Figure B). A⇒B⇒C: This process shows a falling object colliding with shock absorption material, causing the material to experience compressive deformation. A represents the collision, B represents maximum impulse force, and C represents maximum deformation. C⇒D: This process shows a falling object passing the lowermost point (i.e. maximum deformation) and getting pushed back by the repulsive force of the shock absorption material. D represents a point to which the object bounced off and away from the shock absorption material. Scaling down the force at B, the maximum impulse force, is important in not letting the falling object breaking from impulse force. 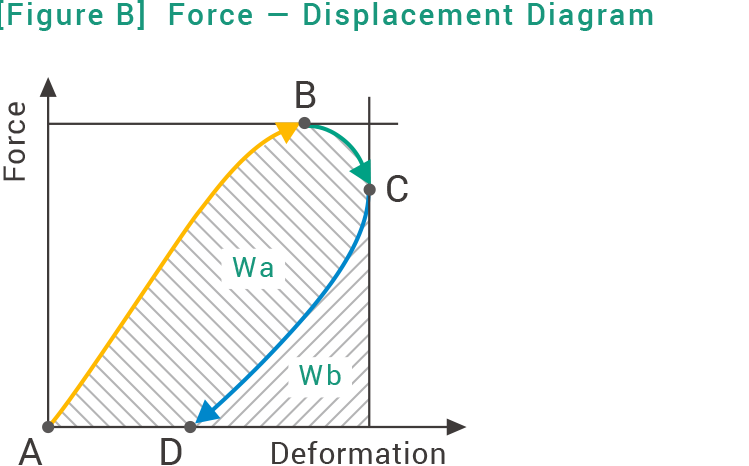 The impact energy from the falling object gets converted into the shock absorption material’s deformation energy, equivalent to Wa+Wb indicated in Figure B. This means the key to reducing maximum impulse energy is selecting a shock absorption material that maximizes the sum of Wa and Wb.